They say "Bigger is Better" and that's definately true with the JUGGERNAUT®. Combining two of our most challenging obstacle courses, the 22' Vertical Rush™ and the X Factor™, the Juggernaut® is designed to seperate the best from all the rest. 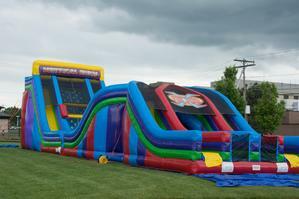 160 feet of challenging fun, as contestants go through the tunnel, up the rock wall, down the large slide, then climb another rockwall, criss cross their opponent, and slide down to the finish! Min. Player Height ..................................... 34"